This is the Varez Ward we've all been waiting for. The high-scoring of Auburn’s 91-88 loss to Mississippi State Saturday afternoon in Starkville was certainly a surprise, especially for Auburn supporters who are used to their Tigers dealing with their fair share of struggles on the offensive end, but also seeing them play a shutdown brand of basketball on defense. Coming into the game, Auburn ranked dead last in the SEC in points-per-game, and had had a dreadful time scoring in games away from Auburn Arena, averaging 54.8 points in road games on the year. But Auburn had also done a decent enough job, as it has all year, in keeping scores low and finding ways to limit what the opposing team was capable of on offense. 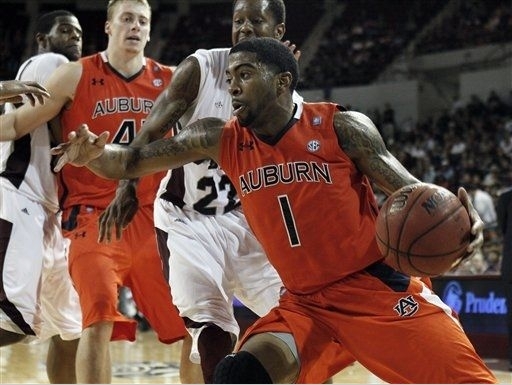 Everything seemed backwards on Saturday, when Auburn’s usual grind-it-out pace and pressure defense gave way to up-tempo play and quick ball movement, leading to a high scoring affair in Starkville. It was a surprising sight for Auburn fans to say the least, to see their Tigers allow the Bulldogs to shoot 60.4% from the field (and 63.2% from behind the 3-point line), but it was just as surprising to see Auburn getting to the rim on offense, finishing plays in breakaway transition, finding different ways to score the ball, and finishing the game with a season-high 88 points. It was a surprise, but a pleasant surprise, and it was the type of game that Auburn supporters would like to see more of from the Tigers offensively, especially on the road. What Auburn proved on Saturday is that even when they’re unable to control the tempo of a game to a slower pace (or when the game plan is to run with their opponent, which it quite possibly could have been against Mississippi State), they still have the capability of scoring in bunches and keeping up with their opposition, even on the road in a hostile environment. With the defense caving almost automatically to the inside presence of Renardo Sidney and Arnett Moultrie, there was almost no perimeter defense for Auburn to speak of, and the Bulldogs made them pay for it. But despite those and more of its usual issues and customary scoring droughts in the second half, Auburn was able to fight and claw their way back to within striking distance every time Mississippi State made a second-half run to pull away, and the Tigers were able to bring the game down to the last few minutes, which is just about as much as any Auburn supporter could ask for playing against a team that’s playing as well as Mississippi State is, on the road in The Hump. And if nothing else, Auburn fans at least have to be encouraged that the Tigers played by far the best basketball they’ve played on the road all season. It was one of the best games it has played, bar none, on the offensive side. One of the driving forces behind Auburn’s recent scoring success is point guard Varez Ward’s coming into his own in his last three games. After a week off from practice to heal a quad injury suffered in the Arkansas game (and, incidentally, rest a bum knee and a groin injury that have been nagging him all season) the well-rested Ward returned to score 12 points against Tennessee, 17 points against Georgia, and a career-high 24 points against Mississippi State. He brings several weapons to the position but withrested legs, Ward has had an extra hop in his cuts, and an extra step in his drive, and he’s providing an added dimension to the offensive attack that the Tigers were missing.. In these last three games, Auburn fans have finally started to see flashes of potential of the Varez Ward they’ve been waiting for — a true point guard that provides a scoring threat all his own, and can bail the offense out of possessions with his dribble-drive by either finishing at the rim or drawing a foul and getting to the rim after the offense has bogged down or broken off of a play. Healthy Varez Ward is definitely something fans want to see more of in the future; so is the effort seen in how opportunistic the Tigers played with the basketball in their possession on Saturday. Auburn has finally been able to duplicate some of the things they’ve been able to accomplish at home in Auburn Arena on the road. But their next challenge will be to put together a full game, on both the offensive and defensive ends, and find ways to piece together a more complete game, no matter where they play. If Auburn can do that, they’ll start ending more and more of these games with victories. And that’s definitely something they’re going to want to do in their next game. It’s the biggest game of the year tonight in Auburn Arena. Tonight, the Crimson Tide is coming to town. Related: Chuck Person’s 1980s Rifleman poster.